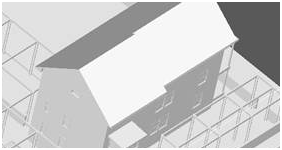 Create 3D Prints of your Revit 2009 models. As architects and engineers start their digital designs earlier and keep them digital for longer, they want a way to still physically interact with their designs. With the economical availability of 3D printers this has become possible. 3D printed models increasingly serve as a critical part of the design process to study design options and improve communication between project members and owners. The STL Exporter for the Revit 2009 family of products is a proof of concept project that we are working on. It is designed to take a 3D Revit building information model and create an STL file that can be used for 3D Printing. We invite you to take it for a spin and see what you think. We look forward to hearing your feedback. Download the ZIP package that cantinas the installer, installation and user instructions, and a feedback form. Follow the Read Me file to install the STL Exporter. The next time you open Revit 2009 you will see a new option called Export STL under the Tools::External Tools menu. Load a model and select a 3D view that you want to use as the bases for your print. Using the instructions in the Read Me file set up your 3D view in the one of the Revit 2009 family of products. Export the model using the command under the Tools::External Tools menu. Make any required changes to the STL file using an STL viewer. Print the STL file using a 3D Printer. I went to the above website and downloaded the STL Exporter. Loaded on Revit Structure 2009. It saved the file. In the read me file its is asking to used the STL viewer to check for error. Where can I find the viewer. This is a cool feature but wanted to warn people. Model objects are drawn to scale in Revit, a web that is 3/8" thick is really that size. Therefore adjust may need to be made to the model and/or the 3D printer to embellish the model objects to be thicker so that they can support themselves and other objects. Printer a model with paper thin volumes won't live long in the real, gravity bearing world.